Polaris 3083 is the inner, north’s largest master planned precinct that proudly supports the local community. Last month, as part of our community centred approach we partnered with La Trobe University and Northern Combine Cycling to help bring not one, but two vibrant, local community events to life. The Autumn Cycling Classic event saw 300 enthusiastic cyclists racing around 3 kilometres of fully closed roads in an effort to integrate cycling into our city. Many more local spectators were drawn to the event which offered insightful information on bike maintenance and exposure to university life. 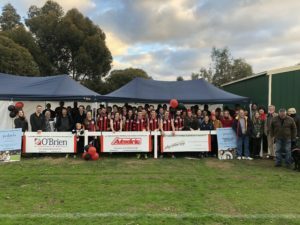 As part of its ongoing sponsorship of the La Trobe University Football Club, Polaris 3083 also sponsored the football clubs family and friends day. The event gathered the local community to watch the senior teams play, whilst providing entertainment for spectators throughout the day. Polaris proudly supported both events and presented information on its remaining Eclipse heritage apartments and townhouses, as well as lunar apartments to spectators. Polaris’ close proximity to La Trobe University campus has seen our retail offering enhance the lifestyles of students at the university with restaurants, cafes, amenities and shops all within reach. Students, teachers and workers at the university have found its appeal exceptional with a number choosing to reside at Polaris.